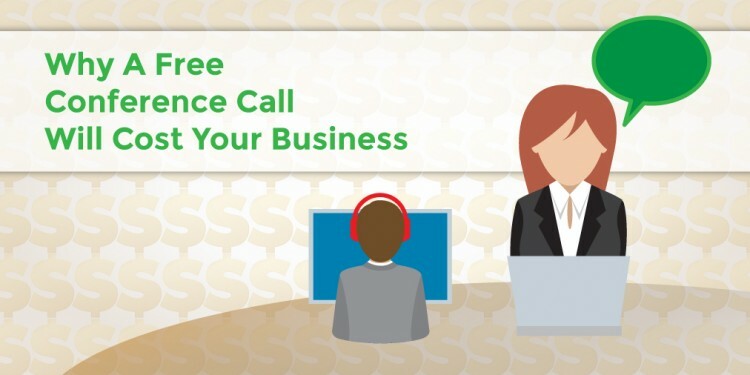 Looking to save a bit of cash, you, at Company XYZ, sign up for a free conference call provider. After browsing a website, you enter your credit card information, and you’re done. Your boss asks for the moderator code and dials in to book a teleconference with a big client, Company 123, to discuss a new business deal. You proudly provide the conferencing details and let him know that it’s free. Pat yourself on the back for a job well done. Your boss uses the code and waits while his big client joins the call using a local dial-in number. The client, however, is in a different state, and unknowingly will have to pay long distance charges just to get involved in the teleconference. The big client’s lawyer tries to join the conference on his VoIP phone since he’s at his vacation home in Mexico, but is unable to access since free conferencing services does not allow dial in by VoIP. Once they finally get connected, it turns out they got a bad line with so much static that they are unable to communicate – a common occurrence with these services. They each try to call the operator for assistance, but free conferencing services don’t offer any support and don’t guarantee proper functionality. They could call customer service, but customer service doesn’t exist. As a result, they choose to reschedule their meeting for a later date. This big client has now wasted their time and money trying to have a conference call with your boss. They attend a networking event and tell their friend about the incident, who then tells another friend. Your brand reputation is now affected. Eventually, they call off the deal after talking to their associates. This is how quickly the costs of free conferencing add up. The solution? Quality and reliable audio conferencing from an experienced company with professional customer service. Here are four reasons why free conferencing will end up costing your business in the long run. If an issue comes up at some point while conferencing, wouldn’t it be great to have a support team at your disposal? Online Q&A’s don’t compare to having support staff ready to help you resolve your issue quickly and get you back to working. Don’t you want customer service this cheerful looking out for you? Whether it’s a customer service department, an account executive that signed your business up, or a solutions engineer who is an expert in training businesses on the use of various technologies, make sure your next conferencing provider has a support system in place for you in case unexpected issues arise. Since free conferencing providers don’t use toll-free numbers, everyone on the call is subject to long-distance charges and other fees if they’re not local. Look for a conferencing provider that offers a toll-free bridge rate, so whoever calls you doesn’t get charged with long distance fees and they don’t have to pay a dime to participate. Think about that for a second. You have a potential client that you’re selling your services to, and they could incur charges just to hear a sales pitch or more about your products. What kind of reputation would you be conveying? Free conference call providers are also public switched telephone network services that exclusively use regular telephones. That means that VoIP (voice over internet protocol) systems or other internet call services such as Skype can’t use their service. Plus, to have international participants, it’s usually a “premium” feature that you have to pay for or that your participants need to pay per minute to use. Paid audio conferencing providers have no problems with international participants, and if a preferred international rate isn’t preferable, using an internet service to call in saves the cost altogether. The whole purpose of a conference call is to communicate with other people. If free conferencing can be unreliable and jeopardize your ability to perform your most essential task, then what’s the point? 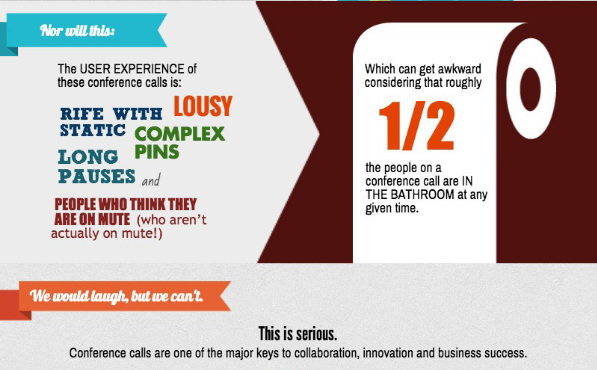 Low quality calls are killing your conferences. Click to view full infographic on Entrepreneur. There’s a reason why the professional quality technology used by conferencing providers is sought by so many businesses. When you pay for quality conferencing, things like static and humming are non-existent. Everyone on the line is heard clearly and their voices come through at similar volumes, so there are far fewer times that anyone on the line needs to repeat themselves for clarity. Look for an audio conferencing provider that uses copper lines with no packet loss. Free conference services discourage the use of speakers, headsets or cordless phones since they could add more static to the line, but clear lines from a paid conferencing provider let you use any peripherals that you’d like. A service level agreement (SLA) is an agreement between the customer and paid audio conferencing provider on specifics such as definition of service, performance guarantee, and dispute resolution. Free conferencing providers, however, never provide their customers with SLAs. Since nobody is paying for the service, there’s no urgency to ensure their equipment works as promised for every user. After all, free conferencing solutions do not own their own infrastructure and rely on using that of other existing companies. The result? Possible outages, being subject to peak times, and limited service availability. Look for an paid audio conference provider who provides you with a service level agreement, and one that guarantees that their service(s) work 99.9% of the time. It’s a common question that gets asked. Just like a lot of things in life, however, you get what you pay for when it comes to onferencing. Your company has worked hard to develop a professional reputation. Why jeopardize that and choose an unreliable conferencing solution just because it’s free? Instead, choose a paid conferencing provider that provides quality support and a reliable product. For help with all of your quality audio conferencing needs, contact Pragmatic today!